our on-going commitment to service quality"
First setting sail in Halong Bay in 2007, Bhaya Group's constant innovations have raised the bar among cruise operators in this remarkable UNESCO World Heritage Site. Today, operating 17 overnight boats encompassing three exclusive brands: The Au Co Luxury Cruise, Bhaya Legend Private Cruise (Legend Halong) and Bhaya Classic & Premium Cruises, Bhaya Group is the largest and most reputable cruise operator in Halong Bay. Bhaya Group - What we do? Bhaya Group's entire fleet of boats reflects an unbending commitment to deliver global standard, quality cruise services, ensuring full comfort and memorable cruise experiences for passengers. Since the inauguration of its first ship in 2007, Bhaya Group has consistently delivered memorable cruise experiences with quality services, and we are committed to continuing this record of excellence. At Bhaya Group, we work hard to ensure that our on-board services are exceptional, but our cruises remain fundamentally focused on experiencing the wonder of Halong Bay. Our first mission is to protect and promote this wonderful UNESCO World Heritage Site. Committed to promoting Halong Bay, Bhaya Group is active in environmental protection and community support around the bay, ensuring sustainable tourism and improving the quality of the cruise experience. Since its launch in 2007, Bhaya Classic has pioneered the overnight cruise concept in Halong Bay while offering authentic cruising experiences in Halong Bay. Bringing the best value for money and earning the trust of around 35,000 guests each year, Bhaya Classic has earned its leading position as the most trust-worthy cruise in Halong Bay. Each of the 8 Bhaya Classic ships has between 4 and 20 cabins accommodating 12-40 guests per cruise. The relatively small design of the ships create informal, warm spaces promoting a convivial feel on board. 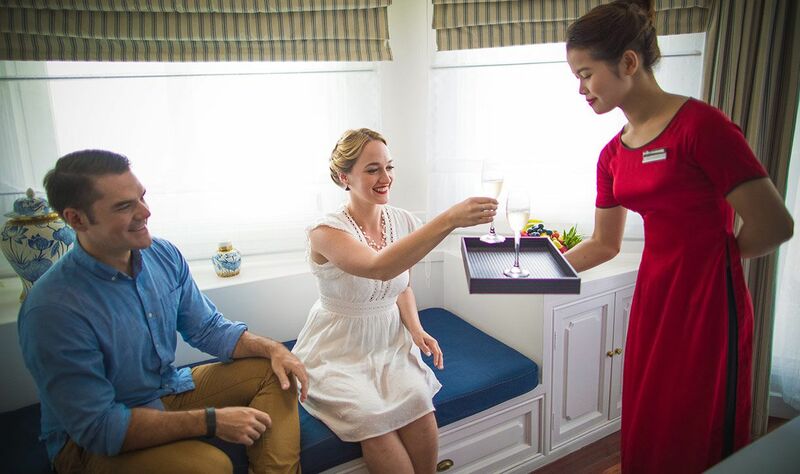 Launched in 2012, The Au Co Luxury Cruise, the first true five-star cruise in Halong Bay, set a new premier standard of service and revolutionised the way guests enjoy the beauty of the bay. The 3 day itinerary and sophisticated on-board service are unique points that distinguish The Au Co Luxury Cruise from other five-star Halong cruise brands. The 2 Au Co ships, with their western-oriental design, offer large cabins and suites, as well as modern facilities for up to 80 passengers. With a total of 7 boats, boasting from 01 to 03 cabins per boat, the fleet is especially suited to couples, families and small groups who seek a private experience in Halong Bay. Practising its foundational principle of sustainable tourism for a positive impact on both environment and community, Bhaya Group strictly applies responsible practices, with a human resources development programme, environmental protection & community initiatives.